The ability to easily perform a malware scan on your WordPress sites has been part of CMS Commander for several months already. However until now you had to trigger the scan manually from your dashboard whenever you wanted to get updated scan results, which was just not feasible for people managing many sites and valuing their time. Luckily that changes now with the update we have released today: To make your life even easier and help you save more time CMS Commander will now automatically perform malware scans for all sites you manage with us. The scans are performed on (roughly) a bi-weekly schedule and you can find the results directly in your dashboard by hovering over the shield icon. Should malware be discovered on any of your sites you will also immediately get an alert email message from us so that you can act right away. There is no need to activate this new feature and automated malware scans will be performed for all premium accounts starting today. 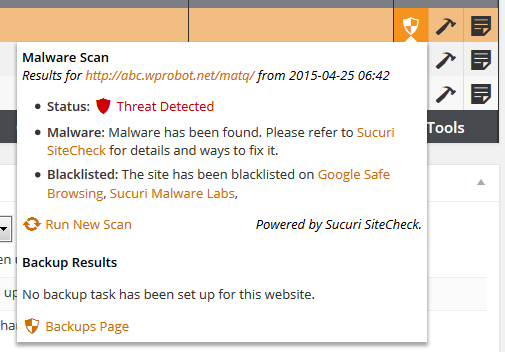 Please note that free accounts only get access to manual malware scans. Another addition in today’s update is the ability for subuser accounts to access the media features on the Post Editor page in CMS Commander. That means your subusers can now easily upload photos when posting to their managed sites just like in your CMS Commander main account, which is very useful for example if you employ editors who you want to give access to your dashboard for remote posting.